This sounds and looks wonderful! And I just happen to have gluten free pearl couscous in my cupboard. . .
Yay! It’s really delicious, too! 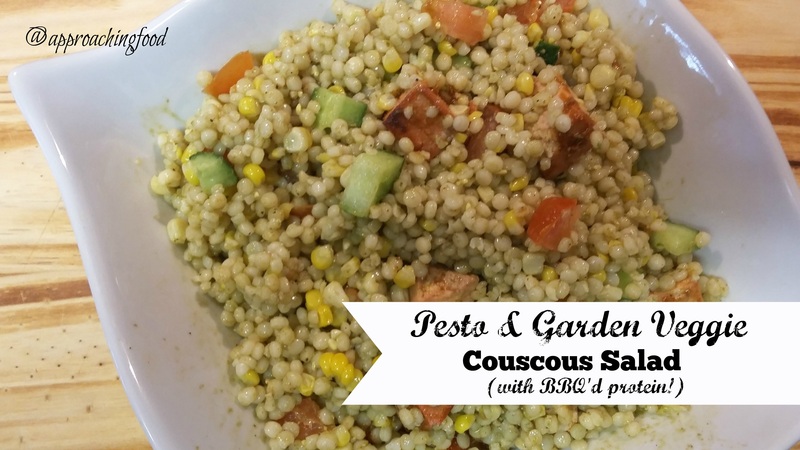 I love pearl couscous for chilled salads! I’ve done something similar using a bottled herb dressing but I have lots of cows cos and lots of pesto on hand so I think I will be making a big bowl of this later in the week (plus there is already some BBQ chicken in the freezer) – so great idea! I think a bottled herb dressing sounds fabulous! 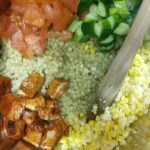 I was surprised at how delicious the pesto was with the pearl couscous, so will be making variations on this theme for a long time to come! Do let me know how your salad turns out! That would be Cous Cous!!!!! Damn Auto Correct drives me mad some days! What a great salad, this will be delicious! Hope you are having a great week and thanks so much for sharing your post with us at Full Plate Thursday! I am the only one in my family that likes fried green tomatoes. It is hard to make it for just one person. Do you have a recipe that would not be soggy the next day so I could eat the leftovers? I make fried green tomatoes, but I’ve never had them at a restaurant and never know whether or not how I make them is how they’re actually supposed to taste. But I always think that it’s hard to go wrong with breaded and fried veggies — they’re so delicious! I randomly search for recipes and keep trying new ones, but never have leftovers so am not sure if they would or wouldn’t be soggy. I’ve heard that you can freeze them before frying them; maybe that would work so that you could just make a serving at a time?